Last Thursday on April 11th was Semi Co-op’s fourth anniversary! Time has gone by so incredibly quick. And I’m really proud to say that during these four years, we never missed a single update! Resulting in 212 weekly comics, 3 sponsored comics and, thanks to CoolStuffInc, 26 extra comics for all of you to enjoy. We previously only shared the extra comics on our social media channels but felt like we were missing a place where people can read all of them. So… you can now also read them here on our website! We’ll post them on this page, which you can find in the menu under “Sketchies”. We’ll update this page on Wednesdays. To celebrate four years of Semi Co-op, we’re giving away signed prints of your favorite Semi Co-op comic on our Facebook, Twitter and Instagram account! All you have to do is share your favorite comics, using the hashtag #BirthdaySemiCoop (on FB, don’t forget to set your post to public and tagging us to make sure we see your entry). Thanks to The Six Stages of Agricola, all lone sheep are now named Timmy! You obviously haven’t considered the added constant bright lighting at the table. My electric bill has gone up since I spend weekends will full illumination even in the daytime to reflect off the shiny board. 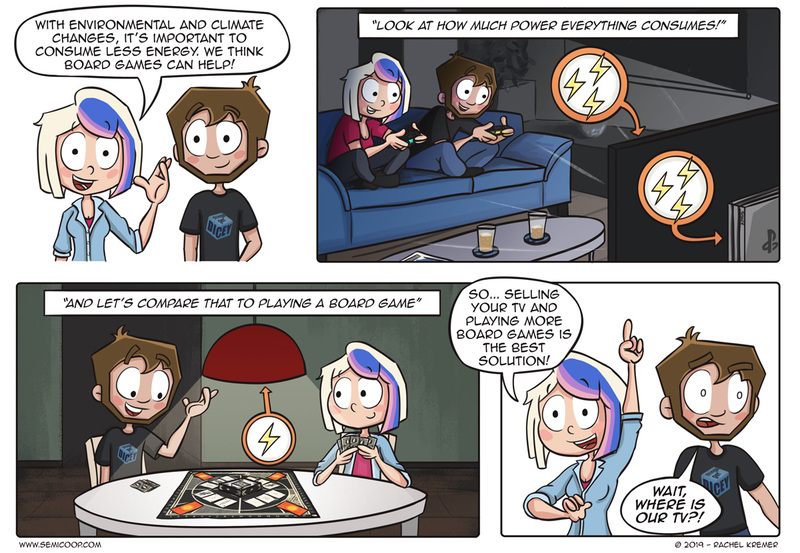 🙂 Video games, those can be played in the dark…board games, few exceptions, not.